WaiBOP United have survived a second half revival from previous ASB Youth League leaders, Southern United, to record an impressive, and hopefully telling, victory and move to second in the standings. After a steady start the match burst to life in the 19th minute when a Southern goal sparked a burst of four goals in seven minutes. Marc Evans restored parity for WaiBOP after only two minutes, then pushed us in front with a second goal just a minute later. Paul Clout then got in on the act, scoring our third goal before the half hour had ticked over. We managed to work the Southern keeper on several further occasions, but entered the break with a seemingly comfortable 3-1 lead. Southern fought back after half time, with two inside five minutes leaving the match level a three apiece with 17 minutes to go. Dylan Bull received two quick-fire yellow cards, leading to a red, leaving us to play the final 20-plus minutes with ten men. Thankfully Evans would have the final say. He pounced from a corner to push us back in front and complete his hat-trick in the process. 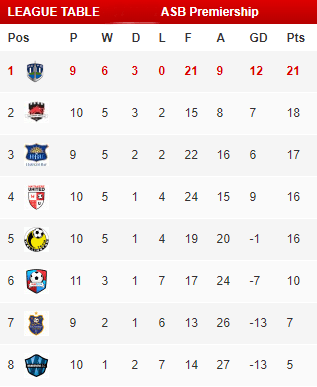 We now sit two points behind league leaders, Team Wellington, who we play next weekend. Seven teams sit within three points of us, however, in what is turning out to be a compelling ASB Youth League title race. WaiBOP line-up: Neil Achary; Bailey Webster, Tom Probert (Jackson Houlihan 63′), Luke Searle, Raheem Hunter-Ali (Jacob Brown 46′); Jono Viviani, Blair Bates, Liam Hayes (Jacob Mechell 58′); Dylan Bull, Paul Clout (James Davies 74′), Marc Evans (Quinton Kipara 90′). Goals: Marc Evans 21′, 22′, 84′, Paul Clout 26′.